“Bert House was built between 1720 and 1730 for Captain William Burgh who was Comptroller and Accountant General for Ireland to a design prepared by his brother Thomas Burgh of Oldtown. Thomas was Barrack Overseer in Ireland, a position to which he was appointed in 1701 and was responsible for the building of Trinity College Library, Dr. Steevens Hospital, Dublin and Collins Barracks in Dublin. The latter building is now part of the National Museum of Ireland. The original Bert House consisted of a central block of seven bays, three storey high over a basement. The overlapping side wings were added early in the 19th century. It’s a house steeped in history and the people who lived in Bert House figured prominently in Irish history at various times.” This is an extract of an interesting article written by historian, Frank Taaffe, as part of his Eye on the Past series. 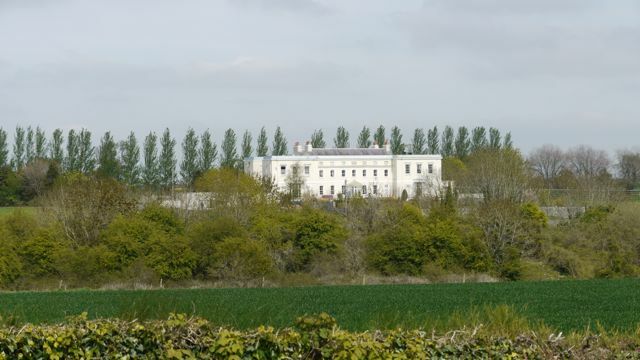 Its still an impressive mansion on the bank of the River Barrow a few miles north of where I live. I’ve included a photo I took some time ago. In the photo the river is hidden by the line of trees in the middle distance. 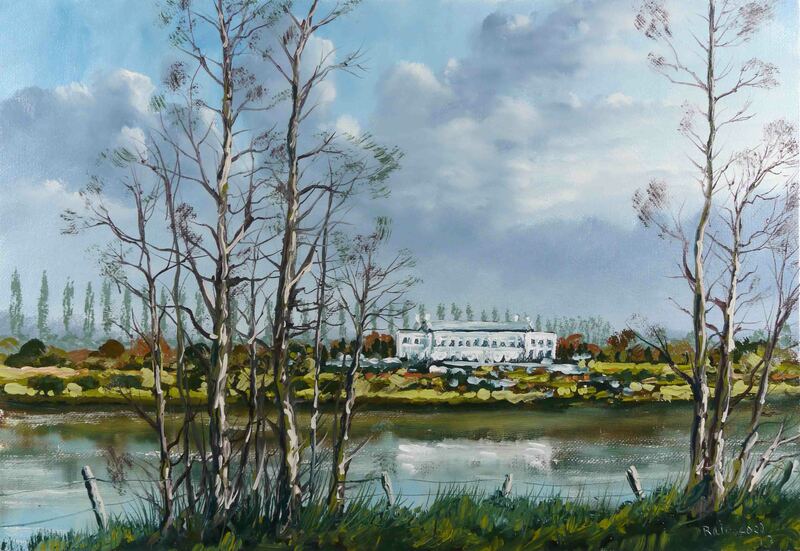 From the viewpoint I used in the painting, the house is obscured by trees on the river bank. So this painting is a combination of the two viewpoints, probably how the scene would have looked in former times when the grounds were managed in keeping with such a grand estate. In the last post I mentioned the problems with using a single strong colour in a limited palette of three or four colours. In this painting I’ve used three very strong colours, Alizarin Crimson, Cadmium Yellow and Prussian Blue. There are none of the problems of any one single colour dominating the painting as in recent paintings. This is achieved by using all three in every single colour mixed. Most of the mixing is on the palette with some mixing produced by blending colours together (as in the sky). Another way of ensuring all three are in the applied paint was by using the same brush repeatedly without removing the previous paint. In this case a ‘filbert’ No. 8 (three quarters of an inch wide). Of course mixing equal quantities of all three produces a grey (as in the clouds), so for example, when a green was needed the crimson was reduced but not eliminated completely. The video will be ready to post in a few days, see you then. I like strong rich colour in my paintings. This does not mean I dislike the delicate soft colours used by other painters, I do, but I’m not comfortable painting delicate pictures. Is this the process which creates a particular ‘look’ or style in an artist’s work? There are two ways I keep colours strong (high chroma). The first is by restricting the number of colours in the paint mixes. More than three in a mix and there is a definite reduction in chroma. If there are only three or four on the palette to start with, its impossible to accidentally or unintentionally introduce a range of weak colours into a painting. The sky in this painting is delicate and soft. The blending brushwork contributed to this but also, the colours were mixed on the palette and the four colours were used in the mixes. The same four colours were used in the lower ground part of the landscape. The colours in this part were mixes of mostly two colours. 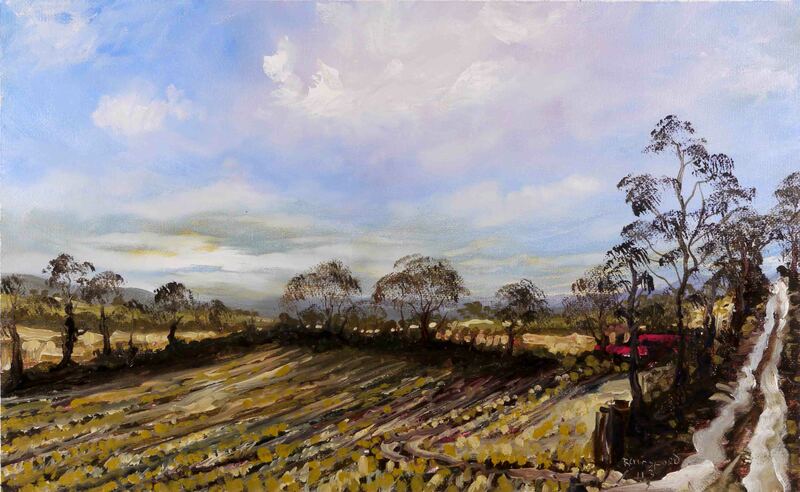 The brush strokes were short dabs of colour not blended together on the canvas as in the sky. The result was strong rich colour, the sort I’m comfortable with. There is one little issue which can complicate this arrangement. Some colours are extremely strong and one such colour, Alizarin Crimson in this case, in a limited palette can be problematic. A fellow blogger, John Clinock (art rat cafe) asked what I mean by ‘Alizarin Crimson is hard to control’ and this painting is a good example of what I mean. In the sky, the tiniest quantities of crimson were added to the mixes. Regardless of this, there is a definite crimson tinge throughout the sky. This was OK in the sky. To maintain harmony throughout the painting it was necessary to have the same crimson in the lower part of the painting. Adding it to two colour mixes would have produced a range of crimson shades, an unnatural range for a winter stubble field. By initially having a solvent wash of crimson and placing colours on top without completely covering the crimson I got my stubble colours with a hint of crimson between the brush strokes. Crimson ran riot in the sky but was restricted in the lower area of the painting. The process revolved around the intense tinting power of Alizarin Crimson. Viridian Green would have to be treated in the same way to avoid the green haze seen so often when this colour is used. Have a look at the video and hopefully the process will be a little clearer. 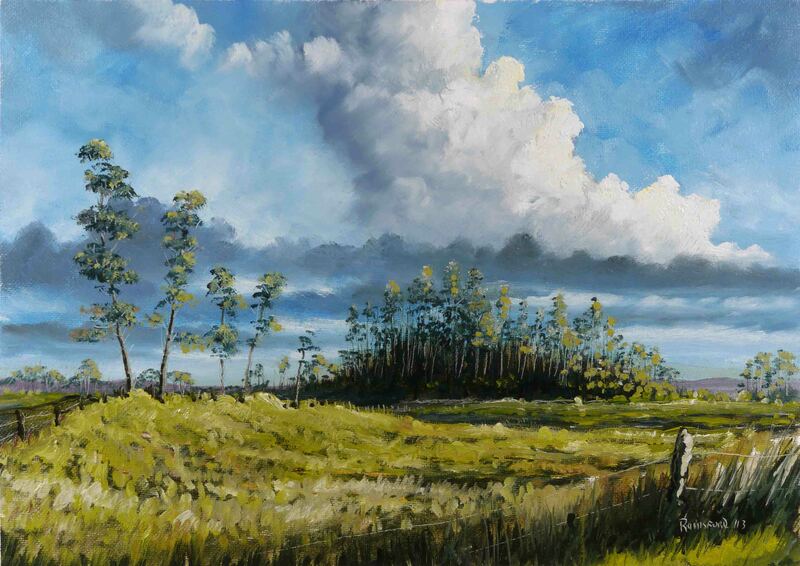 There are two contrasting parts to this painting, the sky and the ground. The approaches in painting each are very different. In the final painting the only thing that bothers me is the lack of consistency of texture between these two parts. This is something I worry about in an abstract way, in reality it doesn’t bother me. The solid gritty landscape with a soft misty sky seems, to me at least, a most pleasing arrangement. A more important issue is the colours used. By using the same colours in the sky as I intend to use on the ground, stitches the two extremely different areas together. The proportions of the colours used in each part are different of course. The sky was produced by blending the colours using larger brushes, but not to the extent that the strokes of the brush are lost. I use ‘filbert’ shaped brushes here. They are flat with a ‘domed’ shape. The same ones as I used to produce the shapes of the trees later on in the painting. There is a texture created by the wider brushes, but no lines as would be produced by narrower brushes. This texture plus the texture of the canvas increases the surface area of the paint and seems to intensify the colour which is a good thing. Its the narrower round brushes which are used to draw the multitude is lines representing the details in the stubble field. There is no blending or softening of these lines. I said representing the details and this is the case with these details. On close inspection the brush strokes are very much lines of paint but when viewed as part of the overall become the details of the field. The framework of perspective was initially sketched in as thin washes with solvent. The obvious ‘mechanical’ lines were almost completely covered by later brush strokes. The missed bits added to the overall suggestion of details. These bits were pure transparent crimson and blue – the colours which are the obvious shades found in the colours of the sky. The colours used were: Alizarin Crimson, Yellow Ochre, Cobalt Blue plus Raw Umber. Ivory Black and Titanium White were also used. Generally there was no medium used except for a little Liquin in the final stages to help in placing wet lines of paint on a wet under layer. I will post the video of the process in a few days. See you then. I’ve always found it easy to create a landscape sketch with charcoal. Planning a painting involves a charcoal sketch beforehand and these sketches sometimes have a vigour which is lost by the time the painting is finished. Recently I’ve been ‘drawing with paint’ in an effort to capture this ‘sketchy’ quality in the painting. When I painted in watercolours, many years ago, this capability found in charcoal sketching was also available in the medium of watercolours. When I think about it, the approach in these two mediums is similar. As a beginner I was ‘sketching as outlines’ and when I discovered ‘sketching the shadows’ and letting the highlights be suggested as white or tinted paper showing through, the watercolour technique was then available for me to progress to. This is not an option in oils as I’ve discovered over the years. Now and then I will try something new, in oils, in an effort to paint in a watercolour way (for an example see here). I can go so far with ‘painting the shadows’ in transparent washes using a solvent but its only half the story in an oil painting. What makes an oil painting different is that you then have to deliberately paint in the ‘lights’, and this is the crucial point, you are no longer painting ‘shadows only’ as in watercolour or drawing ‘shadows only’ as with charcoal. This is why, I think, I’ve had limited success with ‘drawing with paint’. Its the opposite of the intuitive way a sketch is produced. The obvious question is, why don’t I paint in watercolours and abandon oils altogether? For me, its because an oil painting is such a solid piece of work (once it dries, of course). Almost like a piece of furniture. Watercolours on paper are delicate. The same reason as why a sculptor carves in stone and not wax or plaster. I was reminded of this lately on hearing the Turner Watercolours are on exhibition for a few days. They are only exhibited in January, for a limited time, because the light is at its weakest and is less likely to damage the paintings. By contrast, old oil paintings thrive in light and tend to yellow if kept in the dark. Here is the video of the above painting process. See you soon. I’m still experimenting with ‘drawing with paint’. I may have gone a little overboard, especially in the sky. But I was determined not to do what I’m comfortable with. In the last painting I used Alizarin Crimson, a difficult colour at the best of times. This time I used this colour again plus Chrome Yellow. Not ‘Chrome Yellow Hue’ which is the modern replacement for this poisonous pigment. This tube I have in my box for the last 30 years and in that time I have not used it at all – I must have had a bad experience using it, and abandoned its use. I don’t mean I poisoned myself, more likely I found it made painting more difficult than it should be. My one concession to blending colour on the canvas was the use of a ‘fan brush’ to soften the severity of the brush strokes. My normal approach is to use a wide bristle brush to blend colour smooth and place noticeable brush strokes to emphasise some features. See this painting and note the highlight areas of clouds standing above the smooth blended sky colour (click the photo to enlarge). The above painting now reminds me of the technique used by Paul Henry, especially the way he painted his skies of Ireland. The funny thing is that I love the work of this artist, especially his skies but I’m not comfortable with this type of sky in my paintings. We each have our own road to follow and the fun is finding it, through experimentation, trial and error. On the subject of experimentation, another issue I’m dealing with is the need for really fine detail in small paintings. I mean leaves and tiny branches on distant trees which are just too small to paint as such, even with the help of Liquin, and have to be suggested. Here I placed the paint blobs as small as possible and broke up the colour with a sharp point. Its not ideal, but beats going totally miniaturist. I occasionally scratch features, like the wire in the foreground of this painting, and I think its OK. The painting is 14″ x 10″ and took about 2 hours to paint. The colours used are Alizarin Crimson, Chrome Yellow and Prussian Blue. Three very strong colours. Also in there was Raw Umber, good for the browns of winter. I will post the video of the painting in a few days, see you then. I’m making a conscious effort to draw with paint but not loose the connection with realism. Its all too easy to get involved with the luscious paint and revel in its interactions. Speaking of which, I did introduce a colour I don’t normally use in landscape, Alizarin Crimson, and had a bit of fun playing with this intense colour. The need for staying in touch with reality prompted me to distribute it in every area of the painting. This gave a ‘pinkish’ look to the painting. But it was uniform and not on its own in an area which would become isolated from the rest of the scene. This harmony of colour is a natural part of landscape. I’m using Liquin and this makes the drawing with paint a lot easier. Its only introduced in the later stages, when I need lines of paint to sit cleanly on top of the wet under colour. There are times when lines are too fine to paint individually, as in the leaves of the tree in the last post. 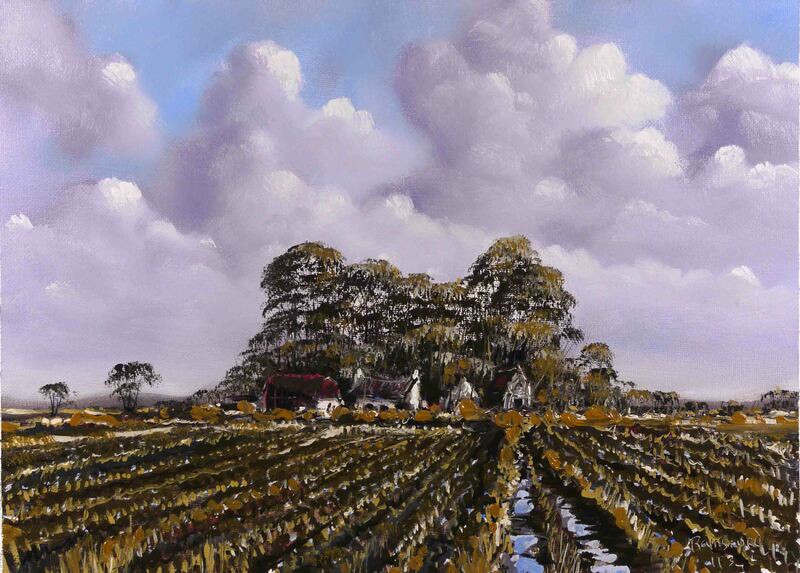 In this painting I was able to suggest the fine branches of the trees by using the flat of a filbert brush. Liquin in the paint mix makes this possible as the ‘sticky’ paint on each bristle of the brush is transferred as a fine line. The filbert shape (dome shaped flat) helps the overall tree shape. I am careful not to over-use this technique as mentioned in the last post. Here is the video of the painting process. The total time was under two hours. The size of the painting is about 16″ x 10″. See you soon. As we are in the season of bare trees, allow me to moan on a bit about painting foliage on mature trees – those huge marshmallow shaped ones. The problem is, should you paint the tree as an enormous solid object or a mass of individual dots representing the leaves. My approach is somewhere in between. I just can’t paint a tree as an enormous green lump, nor do I have the inclination or patience to get out the tiny brush and start painting individual leaves. So I try and represent a clump of similar leaves with clumps of paint of the same colour. On the sunshine side of a tree, there will be more really bright green leaves than the darker shadow green. I find these brush strokes are better with a round brush, slightly horizontal in the centre of the tree, getting shorter as you approach the edge. The clumps This suggests ’roundness’. Its difficult to stay focussed on this task, its nearly as tedious as the individual leaf approach, but its a lot faster. The trees in this painting are not the solid type mentioned above and are easier to paint. But notice the horizontal shape of the clumps of leaves of the same colour. These were painted with the tip of a ‘filbert’ brush and the flat shape of the brush gave the horizontal orientation. 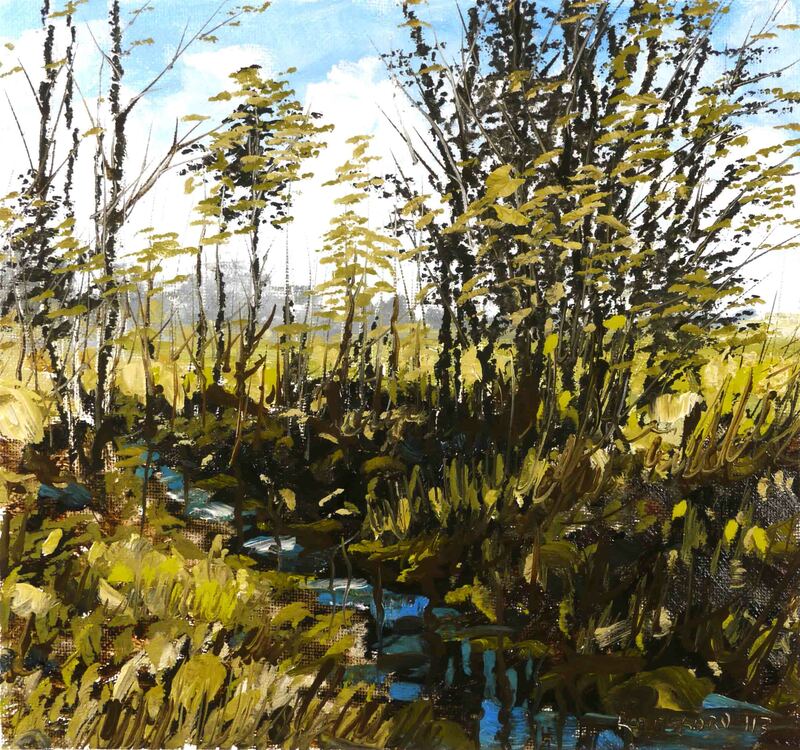 I have a few ‘filbert’ brushes of various sizes, which if loaded with ‘sticky’ paint and applied with a flat dab, can produce a distant tree in a few touches. This, I think, is OK for distant trees where the uniformity produced by this ‘rubber stamp’ method can be disguised, to an extent. I used this approach in my latest painting (see next post). I’m not a great fan of the ‘house painter’s brush’ dabbed onto the canvas to represent trees or clouds. Not only is the uniformity of the ‘rubber stamp’ effect noticeable across the surface of the painting, its also noticeable across different paintings. You do get a painting and this is great, but they will always look ‘cloned’ and you won’t progress to treating each tree with a fresh or different approach. Here’s the video of the above. See you soon.